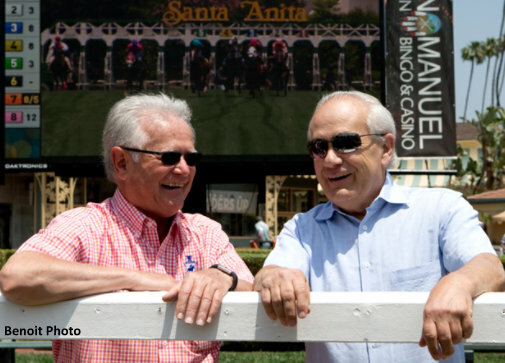 The Edwin J. Gregson Foundation is delighted to announce that it will host a charity fundraising dinner honoring two of California’s greats, trainers Jerry Hollendorfer and Art Sherman. The event will take place on Tuesday, August 22, at the Fairmont Grand Del Mar Resort, located just a few miles south of Del Mar Racetrack. This dinner marks year seventeen of fundraising activities spearheaded by Jenine Sahadi, president of the Edwin J. Gregson Foundation. “We look forward to a fabulous evening celebrating Jerry and Art for their long and remarkable careers in thoroughbred horse racing. Good friends throughout their careers, they greatly deserve being celebrated for the excitement and richness they have each brought to this sport,” says Sahadi. Among the Gregson Foundation’s past honorees are trainers Bob Baffert, Jack Van Berg, Ron McAnally, Mel Stute, and the late Warren Stute, in addition to such industry leaders as Ann and Jerry Moss, Mace and Samantha Siegel, Dr. Jack Robbins, and Joe and Barbara Harper. The Foundation has also saluted legendary jockeys Eddie Delahoussaye and Laffit Pincay, Jr., and Mike Smith and Gary Stevens. Proceeds from the dinner will be used to provide scholarships for the children of California’s backstretch community, as well as a variety of educational programs and recreational activities for the workers and their family members. Tickets for the event are $300 per person. This annual event has proven to sell out each year, and the Edwin J. Gregson Foundation encourages early purchase of tickets to assure attendance. Please contact Angie Carmona at(626) 447-2339 for further information or go to www.gregsonfoundation.com.